Meet Gabby who was diagnosed with keratoconus through our office using specialty testing and advanced corneal mapping. She was later fitted with new Scleral Contact Lenses to provide her with excellent vision and comfort throughout her day. Keratoconus causes the front part of the eye, the cornea, to bulge forward causing difficulty with vision. Patients complain about distortion, glare, poor nighttime vision, and difficulty with glasses and regular contacts. While the reasons are unknown, there are many good treatments. Dr. Tahir prides himself in fitting hard to fit corneas like keratoconus giving every patient the best possible vision and comfort. 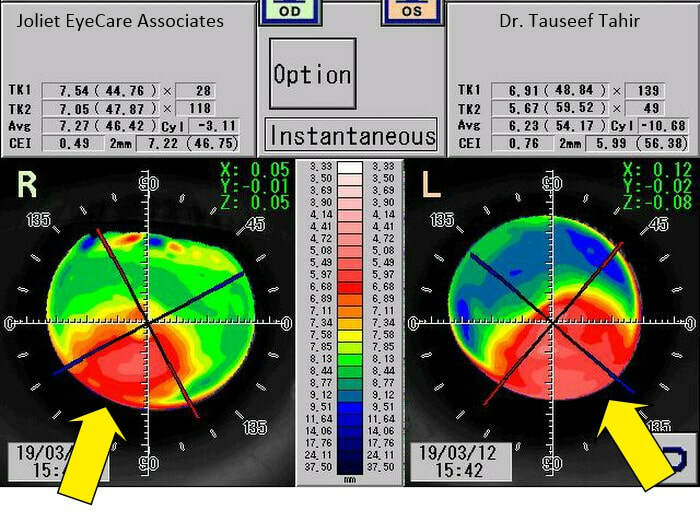 ​From Dr. Tahir: Our patients shows significant keratoconus. 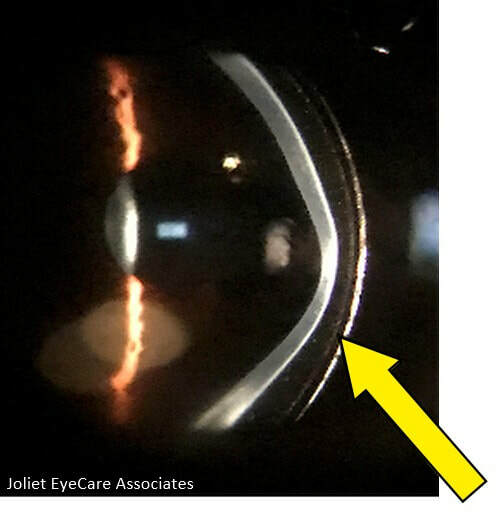 We can see how the cornea, the front clear part of the eye is bulging forward causing distortion in vision, increased glare and poor overall vision.This picture was taken in our office highlighting the cross section of the cornea. Glasses are not a great option for any keratoconus patient. Scleral contact lenses◦ Scleral Contact Lenses (or similar), fitted properly are one of the best options for clear comfortable vision. ​We can see with this specialized scan, budging of the cornea in the lower sections. The left eye is much worse than the right eye. This patient notes great difficulty with vision, significant glare and halos especially with nighttime driving. Scleral Contact Lenses fitted through out office have giving this patient excellent vision and the ability to get back to daily living. Dr. Tahir has treated many patients with keratoconus using Sclearl RPGs and is usually able to achieve excellent vision and comfort. We use the latest lens designs and equipment to take accurate measurements for a precise fit. Dr. Tahir has fitted many patients with specialty contact lenses to combat the effects of keratoconus. These include Scleral RGP contacts as well as other lens as SynergEyes ClearKone, or UltraHealth. These specialty contact lenses are able to clear and cover the cone allowing for a smooth front surface for good vision, decreased halo and glare. Keratoconus is a medical condition and many times your major medical insurance will cover the tests and lenses involved. Many vision insurances such as VSP and EyeMed also have allotments for "medical nessary contact lenses" making them very affordable. We also offer Care Credit, 6 month no interest financing, right through our office making clear comfortable vision a reality. Many vision and medical insurance cover medically necessary contact lenses depending on your condition. GP (Gas Permeable) lens offer the sharpest vision of any contact lenses and are available in a variety of prescriptions. Easy to insert and remove. Scleral lens comfort lasts throughout they day and provide sharp vision.